OTC scope of work : Supervision and coordination of assembly of Fire Module 10, welding works, mounting and assembly of metal structures, high hydraulic pressure testing of pipes, management of loading and crane lifting operations, electrical mounting works and monitoring of their implementation. Kashagan field development project was found at the end of 1997 when consortium of foreign companies OKIOC (in 2001 consortium was renamed to AGIP KCO) and Kazakhstan government signed an Exploration and Production Sharing Agreement for 11 northern blocks in Kazakhstani Sector of the Caspian Sea. The scope of the first stage, known as Kashagan experimental program (KEP), consisted in construction of seven working barges designed for all types of work. 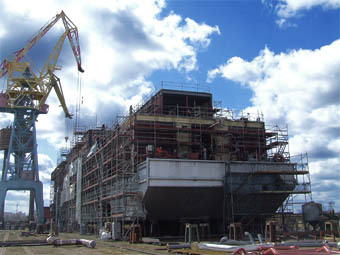 One barge was built in Russia in Astrakhan Shipbuilding Production Association. Module 10 is a service platform, which is a part of Kashagan field’s infrastructure, and it is designed to service oil and gas producing complex. Key facts: length - 95 m; width – 16 m; total weight – appr. 3600 t.
OTC specialists were involved in different fabrication levels at this project: construction management (MO Supervisors, Coordination of electrical mounting and crane lifting operations), supervision of production process (welding, mounting, electrical works) and QC (NDT Inspectors).